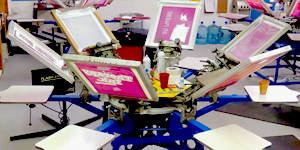 "Screen printing is a printing technique whereby a mesh is used to transfer ink onto a substrate, except in areas made impermeable to the ink by a blocking stencil." 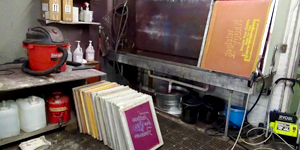 Lake Screen Printing offers quality screen printing for a large variety of products like shirts, bags and more. Our production house is the oldest and largest union printer in Lorain County with over 40 years of experience. Each order goes through a careful process to be printed by one of our expert printers. 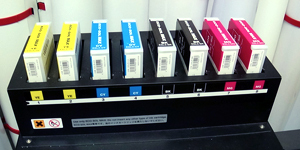 Our in-house screen printing station can print up to 6 ink colors including fluorescent and neon. 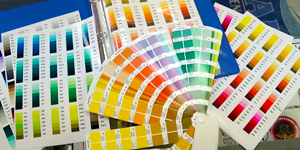 We also have the capability to print in full-color digital (see "Digital Printing"). The screen printing process applies to most apparel and sign orders, as well some promotional products that are made of durable fabric. "Digital printing refers to methods of printing from a digital-based image directly to a variety of media." Here at Lake Screen Printing we offer both small and large-format digital printing for an assortment of different products. 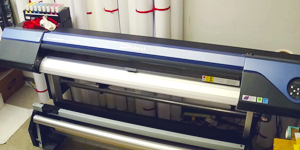 Products such as banners, posters, and decals can be printed in-house off of our large-format printer. Our large-format printer also offers computer-based contour cutting, allowing us to mass produce uniquely cut decals, vinyl, and more at competitive prices. 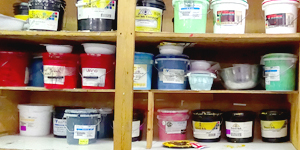 Digital printing is done in full-color, with the exception of fluorescent or neon colors which is exclusive to screen printing (see "Screen Printing"Â). Digital printing allows our artists to take personal photos or full-color business logos and apply them to apparel, business cards, and more. Banners, posters, signs, magnets, decals, and much more are done using the digital printing method. "Embroidery is the handicraft of decorating fabric or other materials with needle and thread or yarn." Lake Screen Printing offers high-quality digitizing and embroidery for your family or business. Our skilled, in-house artist and embroidery team can make your logo into a quality design that can be used for years to come. We also offer a large selection of pre-made designs for you to choose from. While it is not a full-color process, embroidery can be done in many different thread colors and can be created in variable sizes to meet each unique circumstance. Commonly embroidered items are polos, lab coat, hats, aprons, and other durable fabric apparel. ©2019 Lake Screen Printing. All Rights Reserved.